I swear I don't work for Mario Batalli (not that I wouldn't jump at the chance) and I'm sure he doesn't need my publicity anyway. I just honestly love his recipes...all of them...or at least I haven't found one that I don't yet. I'll admit some of his stuff is a little more complicated than others; but I like the challenge. And some of his recipes sometimes use ingredients that are hard to find; but to me that's all part of the allure. Without further ado the latest and greatest pasta dish we tried this past weekend. Bring 3 quarts water to boil in a large pot and add 3 tbsp kosher salt. Meanwhile, whisk the ricotta and 3 tbsp olive oil together in a small bowl. Add the Parmesan whisking until it is evenly incorporated. Whisk in 2 tbsp warm water, then another if necessary to loosen the consistency. Heat remaining 3 tbsp oilve oil in a large pot over medium heat. Add the squash and cook, stirring regularly, until just tender and golden-brown, about 4-5 minutes. Season well with sea salt and remove from heat. Drop the pasta into the boiling water and cook until just al dente. Drain the pasta, reserving 1/3 cup pasta water. Add the cooked pasta and the reserved pasta water to the squash, stirring and tossing over medium heat to mix well. Cover, reduce the heat to low, and allow to steam together for 2 minutes. Stir in the mint, season with more sea salt (if necessary) and pepper. Transfer the pasta to a serving bowl. Garnish with dollops of the ricotta mixture. I'm submitting to Presto Pasta Nights hosted this week by Katie over at Thyme For Cooking. Be sure to check out the round up on Friday. Nice pasta! Mario Batalli was my mothers favorite! Fresh ricotta and mint do amazing things together, no? I love Mario's recipes too, and I'm always happy to find a simple and delicious one like this. Wonderful - pasta and zucchini! I'm desperately in need of something new and this looks delicious! Given the bazillion tons of zucchini around...how many breads and muffins can a girl make? !...this sounds like a very delicious option. Thanks for sharing with Presto Pasta Nights. 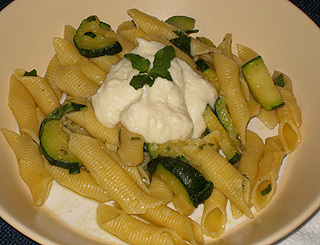 Ricotta, zucchini such a light and tasty pasta dish. I love it. Great recipe. I love Mario too! I love this - and I have all the things to make it! Delicious. How awesome would it be if you actually DID work for him, LOL!!! This sounds so good! So funny, I am making this tomorrow! I'm so glad you liked it. I just adore the combo of squash and ricotta whether in pasta, sandwiches, or pizza. So I'm all over this recipe!